OVER 400 HIGH QUALITY FRAGRANCE OILS !!! Shevei's Innovations was created with a view to bringing Quality Oils, at a reasonably Great Price. 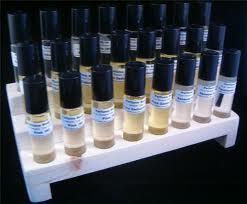 We have some of the highest Quality Perfume Oils in The world. These oils DO NOT have cheap fillers such as baby oil,water or alcohol. These designer fragrances are types of the original fragrances. We do not represent our fragrances as the trademarked fragrances and do not attempt to make any affiliation whatsoever. Due to Health and safety reasons we DO NOT accept or use USED bottles. We DO NOT exchange oils once you have left our sales site. Customers are not allowed to sample oils by rubbing them directly from the bottle onto their skin as this creates a serious health risk for themselves and the other customers.